The Institute celebrates its final of the year "Family Business Spotlight" for the 2015 season. Each quarter we feature a family business that has had a long relationship with the Institute and has a deep commitment to supporting family-owned businesses in Maine. The series is sponsored by Harvard Pilgrim Health Care and Mainebiz. 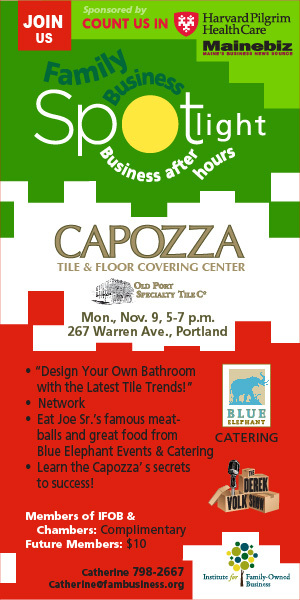 We continue our series with Capozza Tile & Floor Covering Center. Learn the Capozza’s secrets to success!